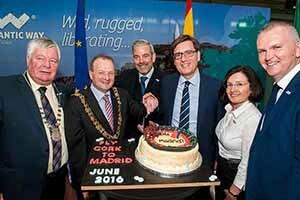 Cork’s new direct service to Madrid with Iberia Express, part of the IAG group, began on June 18th and will operate until September 17th. Flights will be operated by an Airbus 320 aircraft, equipped with 180 seats distributed in 18-162 configuration. Anyone planning their summer getaway can book tickets from today at iberiaexpress.com. 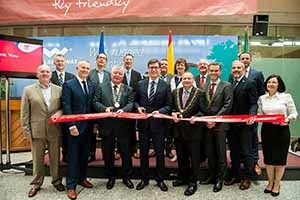 Cutting the ribbon, Rafael Soriano, Deputy Head of Mission, Spanish Embassy, helped by Cllrs Joe Carroll, Deputy County Mayor, Cork and Chris O’Leary, Lord Mayor of Cork. 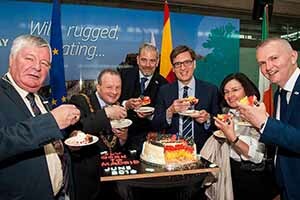 Rafael Soriano, Deputy Head of Mission, Spanish Embassy, helped by Cllrs Joe Carroll, Deputy County Mayor, Cork and Chris O’Leary, Lord Mayor of Cork. Dep. Joe Carroll, Deputy County Cork Mayor; Cllr. 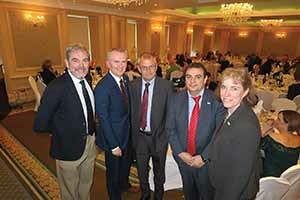 Chris O’Leary, Lord Mayor of Cork; Gonzalo Ceballos, MD, Tourist office of Spain, Dublin; Rafael Soriiano, Deputy Head of Mission, Spanish Embassy; Catalina Goode Lopez, Viceconsul of Spain in Cork and Kevin Cullinane, head of Communications, Cork Airport. 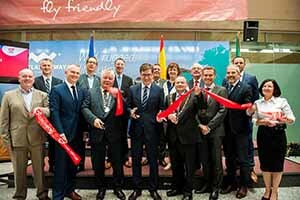 Passengers can choose to fly on via Madrid to many Iberia Group destinations in Spain including Alicante, Malaga and Tenerife; Lisbon and Porto in Portugal; Marrakech in Morocco; and Buenos Aires, Mexico City, Montevideo, Sao Paulo and Santiago de Chile in Latin America. See more pictures here or connect with the album on Facebook. At a previous event for the trade. 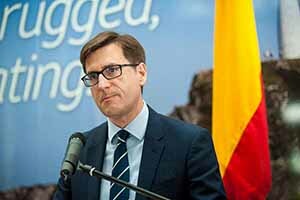 Gonzalo Ceballos outlined the competitive advantages Iberia will offer (listen here), the only business class service out of Cork and a facility for carrying pets (€120, but cheaper than leaving them at home given kennelling costs). Watch here video of the event. 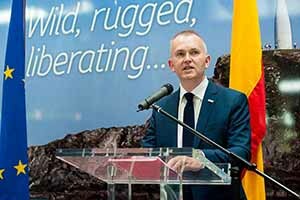 Listen here to Kevin Cullinane’s speech on behalf of Cork Airport. Listen here to Gonzalo Ceballos’s Madrid presentation and listen here to Carlos Pinacho. See pictures of launch event in Cork for the travel trade here or connect with the album on Facebook.